China’s limits on contamination levels have sparked a recycling industry crisis. What are local and state governments doing to solve the problem? It’s a phrase regularly recited in millions of households across Australia, followed by a hollow rumble as the yellow-lidded wheelie bin is hauled to the kerb. It’s a ritual that, in one form or another, takes place in more than 90% of Australian homes. But the Australian recycling industry is facing its greatest challenge yet; one that could result in its collapse unless governments, manufacturers and consumers step up. Yellow bins are still being collected, but in many council areas around the country, their contents are ending up in stockpiles, landfill or being shipped to countries other than China for processing. The recycling industry is in trouble and no one really has a solution. Then in February 2013, it introduced Operation Green Fence, implementing a program of inspections of imported recyclables in an effort to curb rising levels of contamination and rejecting those that didn’t meet contamination standards of less than 10-15%. In 2017, the real axe fell in the form of the National Sword policy. China first announced that it would no longer accept imports of unsorted paper and then followed up by declaring that any imports of recyclables – including plastics – must have a contamination level below 0.5%. The consequences for Australia’s recycling industry have been devastating. Now the industry is caught in a bind: many recyclers can no longer export recyclables to China because they can’t process the materials well enough to meet the new contamination standards. And, as a result of China’s decision, the commodity prices of recyclables have crashed as the market is being flooded with unwanted goods. Furthermore, because of its long reliance on the Chinese market for recyclables, Australia has few domestic outlets for these materials. Despite this, Khoury says recyclers are determined to keep faith with those householders who have been putting out their recyclables. For the time being, no council in Australia has cancelled the kerbside collection of recyclables. Many, like the Blue Mountains city council, are actively encouraging residents to keep putting their recyclables in the yellow bin. But where is it going? Unfortunately, some is going into landfill. Ipswich city council in Queensland announced in April that it would be sending its kerbside recyclables to the tip. Within days, it reversed its decision and instead appealed to households to help lower the contamination rate in their yellow bins to meet the new high standard demanded by recycling company Visy. But the changed conditions are forcing many smaller recycling companies to dump their recyclables in landfill. A Victorian company, which spoke on the condition of anonymity, said it had no option but to send recyclables to landfill and pay the resulting fees. In some cases, the landfill fees are greater than the amount charged to councils for collecting the kerbside recyclables, so these companies are now operating at a loss. Some councils have adjusted their kerbside recycling to the changed conditions – Moreland city council in Victoria stopped collecting soft plastics at the end of 2017. But like many others, it is now paying a lot more to have its recyclables processed, so recycling has gone from being a revenue generator to a cost generator. Some recyclables are being stockpiled while companies try to work out what to do with them. But after a fire of stockpiled paper and plastics in a recycling facility in Coolaroo in July last year forced the evacuation of more than 100 local residents, the Environment Protection Agency (EPA) Victoria was given additional powers to inspect resource recovery facilities and tackle potential fire risks. Recognising that the recycling crisis is challenging regulations around stockpiling, EPA Victoria says it is “actively managing” the impact. Along with enforcing the existing regulations around stockpiling, it has created a taskforce to audit Victorian recycling facilities and identify stockpiling that poses a fire risk. In NSW, the EPA says it is considering case-by-case variations to stockpiling requirements, but is balancing those against safety and environmental concerns. Some recycling companies and councils are looking to markets outside China to outsource the sorting of recyclables and as a destination for the end product. The general manager of YCA Recycling in South Australia, Kai Hau, says his company now sends recyclables to Malaysia, Vietnam, Thailand, Indonesia and Korea for processing, and then ships the processed – and therefore higher quality – product on to China. But this double-handling comes at a cost. “When I send the material to Malaysia, I need to pay customs and shipment, then they process it and send it to China and I pay again customs and shipment,” he says. Hau says the additional costs are passed on to the councils to continue to make it a viable business opportunity. He is also applying for a state government grant to upgrade the company’s onsite processing machinery although this will need at least six months to take effect. The Southern metropolitan regional council in Western Australia, which operates its own materials recovery facility for processing recycling, also anticipated the change in Chinese policy and set up contracts with other countries and markets for the processing and separation of the recyclables it collected from more than 30 local councils and shires. But even recycling companies that were not sending much material to China have been affected by the plummeting commodity prices. Interestingly, the relatively small number of companies in Australia that do use recyclable materials – particularly plastic – to make new products, often struggle to source enough raw material. Tasmanian company Envorinex turns waste plastics into everything from fence posts to tennis court markings. They currently collect their recyclable materials, which include sileage wrap, pallet wrap, crates and polypipe, directly from the source, free of charge, and process it themselves. They are planning a machinery upgrade so they can process household plastics, because their business has been so successful that they can’t get enough raw materials. “They’ve got stockpiles of it, and we’ve got councils within Victoria and Queensland wanting us to replicate our business there,” says the managing director, Jenny Brown. In April, at a meeting of federal and state environment ministers, it was agreed that all Australian packaging should be reusable, compostable or recyclable by 2025, but the move was seen as not going far enough. Acknowledging the precarious state of affairs, several state governments have stepped in with short-term support. 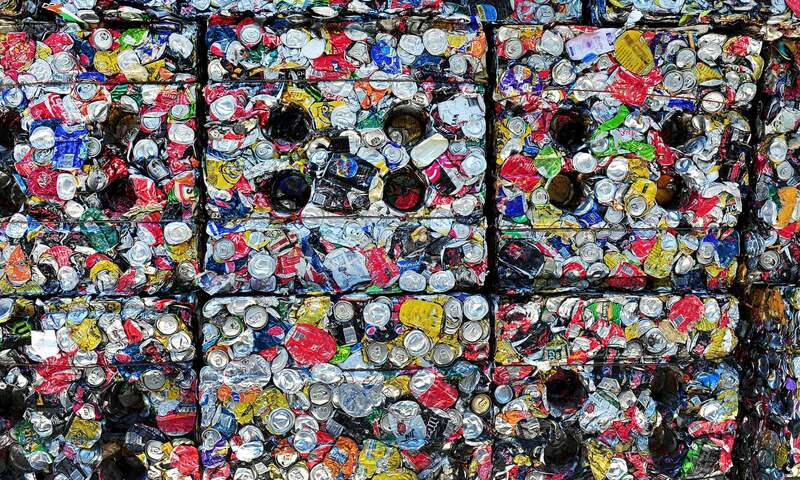 In February, the Victorian state government announced a $13m support package – $12m for councils and $1m for industry – while they renegotiate recycling contracts and work towards longer-term solutions. More recently, it committed a further $2.5m to developing new markets for Victoria’s recyclable waste. The South Australian government set up a $12.4m rescue package for the recycling industry and local councils, with $5.8m worth of infrastructure grants for local government and industry, a $5m loan scheme to support larger projects, and smaller amounts for transport subsidies, education campaigns and grants. NSW has committed $47m in a one-off package to support councils and the recycling industry while they adjust to China’s new policy. It includes $9.5m to help invest in new uses for recyclable materials, including infrastructure projects, and to improve the quality of recycled products. The ACT’s kerbside recycling has apparently dodged the crisis. Transport Canberra and City Services says very little of Canberra’s recycling had previously been sent to China, and most was already sold to recyclers in Australia. The recycling industry is in a state of flux; one that is unlikely to be resolved easily or quickly. But one constant message echoed by councils and recycling companies alike is that now, more than ever, they need households to be vigilant about what they put into the yellow recycling bin.